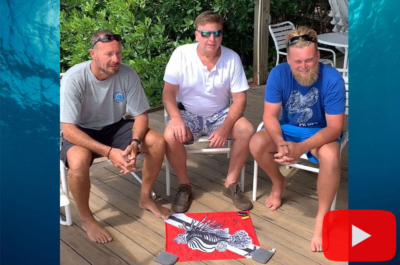 Roger gets stung by a venomous Lionfish – What not to do! 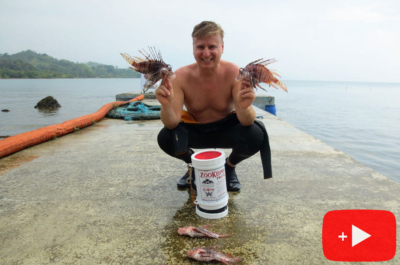 This video shows Roger’s experience getting stung by a venomous lionfish while spearing in Portabello, Panama. 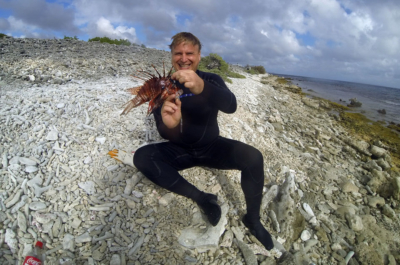 Roger J. Muller Jr., from New Jersey, is an experienced International Lionfish Hunter and professional scuba instructor certified by both PADI and NAUI. He decided to share a story of his first venomous Lionfish sting and why it should not have happened. Roger was down about 55 feet in Panama and got stung. He immediately aborted his dive and went back to the scuba shops boat. Normally Roger is careful and uses proper puncture proof gloves, but in this case, he left his gloves on the boat.The Divemaster from Dive Panama was a bit scared of the Lionfish spines and kept on pulling the Lionfish containment device called the Zookeeper away from Roger. There was some surge in the water on this day and that made it harder to steady the Zookeeper and getting it ready for insertion of the days catch. After spearing some Lionfish Roger not thinking used his left hand to hold down the Zookeeper. While Roger’ hand was on the top of the Zookeeper he ended up poking himself in the left thumb with the Lionfish’s venomous spine. Roger who is now a Lionfish University Reporter reminds everyone to dive safely and use the proper equipment when Lionfish hunting and spearing. 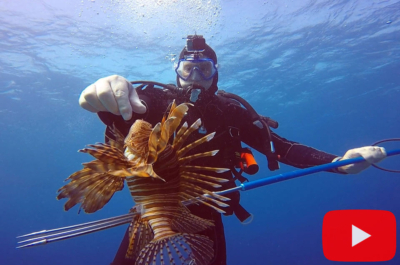 Make sure you are wearing puncture proof gloves and are aware of who is around you when you have the Lionfish on your spear so you do not accidentally spear a dive buddy by mistake. Many people get excited after a kill and don’t think properly, which creates dangerous issues underwater. Roger has hunted the fish in ten countries including Jamaica, Aruba, St. Croix, Bonaire, Bahamas, Caymans, the United States, Curacao, Panama, and Cuba. He kills Lionfish to restore the natural balance in these areas and prevent the marine animal from causing any more destruction to the coral reef ecosystems has a dove in for over 20 years. After graduating with an Environmental Science Degree and honors from Ramapo College in Mahwah, NJ, Roger went into the insurance industry. He is an Insurance Agent and owner of Muller Insurance in Hoboken, NJ. However, he felt that he had let his teachers down by not pursuing a career in the science field. With that in mind, he looked for ways to use his degree. One such way he found the use of his education was when he explored scuba diving for the first time in 1998. He immediately fell in love with the sport. 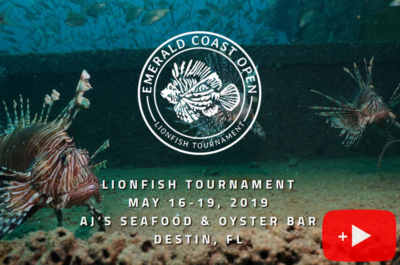 After completing over 111 diving certifications from the Professional Association of Diving Instructors (PADI), he became interested in the Lionfish issue after hearing about it on a dive trip about seven years ago. After that initial exposure, he took a handful of Lionfish training courses, including the SDI Underwater Hunter & Tracker, DAN & NAUI Hazardous Marine Life, PADI Lionfish Awareness and Elimination, PADI Lionfish Hunting Specialty, PADI Invasive Lionfish Tracker Specialty courses. Today, he has over 1,500 Lionfish kills!